Holding the attention of a 7-year-old for more than a few seconds is a tough job: just ask any teacher. Kids’ relentless energy and freewheeling brains mean they naturally flit from idea to idea, and focusing on one thing for even a few minutes can… seem… like… forever. Which is why, in our increasingly attention-deficit world, the best content for children provides handy insights for content marketers. If this stuff connects with these most fickle of consumers, what conclusions can we draw when communicating with grown-ups? At Immediate Media, in addition to our content marketing work for clients like the RSPB and Cineworld, we also have a division which creates many of the UK’s biggest newsstand children’s magazines. From CBeebies to Match of the Day, Girl Talk to Horrible Histories, these magazines have to attract kids’ interest (and their parents’ investment) amidst a sea of free gifts and TV faces. So they’ve learned a thing or two about cut-through. It’s the mantra any self-respecting marketer should live by, but how well do you know the people you are communicating with and could you get to know them better (be honest now)? All of our children’s titles are targeted at a very specific audience and age group (sometimes as narrow as a single year group), which means that most of our readers have usually moved on within 18 months, only to be replaced with the next generation of 4, 7 or 11 year olds. To survive we have to constantly adapt to make sure that our content reflects each new wave of readers’ interests. On the pre-school titles that are purchased by parents, it’s just as important to meet their expectations as producing content that resonates with their child. All of our magazine brands start with a statement about what they are, what they are offering and who they are targeted at. These are then used to ensure that every piece of content is right for our readers. It doesn’t need to be anything fancy, but should be a statement explaining your brand/product’s unique selling point, how it compares to what else is in the market and a profile of your target consumer (name, age, location, life stage, interests, hobbies, heroes). This should provide the starting point for everything you do. The majority of our younger readers are incapable of sending us an email to share their thoughts on a feature. They’re too young to engage with us on social media, and liable to have completely changed their interests, understanding of the world and even, possibly, their personality within the space of a year. So it’s essential for us to maintain regular contact with our target age groups. To achieve this we conduct reader surveys in the magazines and face-to-face focus groups in schools and peoples’ homes to ensure that we have an in-depth understanding of our readers’ worlds. These can be as frequently as every fortnight. After all, there is no one better qualified to tell us what he or she wants. Is it time you booked some quality time with your own consumers? Every piece of content we produce needs to be brought into our readers’ worlds. For example, a distance of five miles is far easier for your average 5 year-old boy to understand if its explained as 77 football pitches. It’s easier for an 8 year-old wildlife enthusiast to imagine a blue whale weighing 190 tonnes if it’s described as weighing the same as 16 double decker buses. These examples are quite specific to children, but the same principles apply to any reader. What do your readers watch, read, like to do? Who do they look up to? What are their interests? How can you bring these into your content? Each magazine needs to sell its benefits hard to stand up against all the other media competing for the attention of our readers. While parents tend to look for quality, variety, entertainment, value, educational value and crafts that are quick and easy, our young readers are more interested in their favourite TV characters, yucky stuff, silly facts, games, puzzles and fun. Our covers unashamedly sell all of these benefits to both. Every feature has to be clear on what it offers. In a world where minimalism is en vogue, it’s easy to forget that people still need to be told explicitly why they should buy your product. 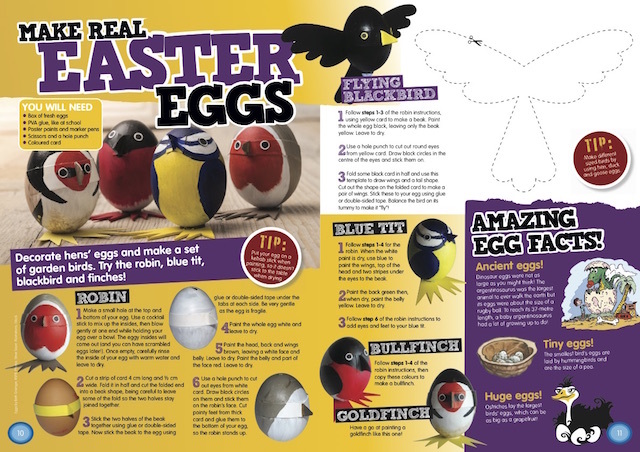 Cool activities and eye-popping layouts sell kids magazines – RSPB’s Bird Life magazine for 4-11 year olds. What image do you want to project to your consumers and does that tally with the product you’re producing? In print magazines fonts are hugely important in providing consistency and brand identity, not least when you’re producing content for such iconic brands as Mr Men and LEGO. On features relevant fonts need to be used to bring each piece of content alive. For example, the word ‘wild’ should look wild. Then there is the paperyou’re printing on. On children’s magazines packed with activities, the main consideration is how the paper is going to be used. Is it crayon friendly? Will it be used to make things (card inserts)? For you it might be a question of whether the printed product projects the sense of quality you want to achieve. If we haven’t grabbed the attention of our reader from the moment they open the magazine, we’ve already lost the battle. Activities are good for the first page, whereas stories can offer a welcome change of pace later on. When words have to be used sparingly, every one needs to count. On children’s magazines it’s often the speech bubble copy that engages the reader the most. Engage the reader from the outset, keep things quick and simple and maintain interest by surprising them from one page to the next. These are universal rules for any magazine worth its salt. Beautiful pictures sell magazines. Cool activities and eye-popping layouts sell kids magazines. As much as any journalist likes to think that their perfectly crafted piece of prose will wow the reader, chances are that reader won’t even read it if the layout or images let it down. On our children’s craft titles such as CBeebies Art, many of the features start with the art. Inventive, audience-relevant design can be just as powerful as a punchy headline, if not more so in the case of children’s magazines. Cover stars on CBeebies Art or Toybox are things you can make. On Girl Talk, a magazine for pre-teen girls, it’s role models. On Horrible Histories it’s a dastardly character from the past. On Mega it’s something, well, mega! What are you offering that sets you apart from the competition and, more importantly, how are you delivering it, in spades, to your audience?